The book that will inspire you or someone you love to listen to the heart. Buy your copy through Amazon or Barnes & Noble. Hardcover, Paperback, Kindle, and NOOK Book. 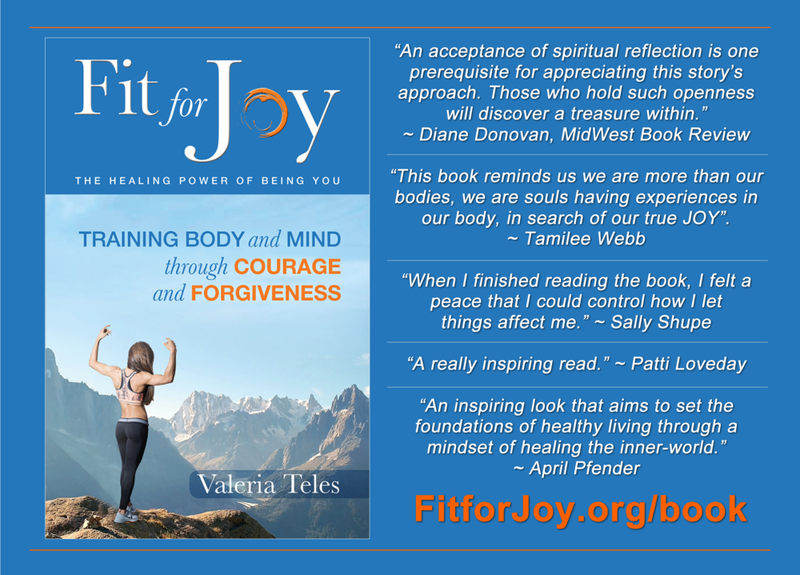 "Fit for Joy is a raw and emotional story that is told from the heart of Teles. She takes you along for the journey she faced including all the highs and lows. A personal account of the struggles she faced to find a healthy center balance. Fit for Joy is full of reflection and relatable struggles that many people deal with daily. A really inspiring read." "An inspiring look at a journey that aims to set the foundations of healthy living through a mindset of healing the inner-world." Albena here. Just wanted to let you know that I finished reading your book last week and I am absolutely blown away! What an incredible, true and deeply moving message! It resonated with me so much, even though I don't have exactly your background, many of my life experiences are very similar, especially in my dance career so far and what you're sharing about finding the joy in what you are doing relates to me so strongly! I admire your honesty and courage to bring this to the world and I would love to get in touch with you - just to talk more! Much love and many hugs." Want to read Chapter #1 free of charge? I could not believe this woman and how out of touch she was with reality. She was obese, for God’s sake! She could actually die of a heart attack at any moment, and my mind refused to believe that anyone could be at peace with a body like hers. It couldn’t be possible. I insisted. I tried to force her to make a deal with me by asking her to agree on losing one to two pounds per week. Once more—with the same serene, happy look on her face—she replied that I didn’t understand her. Patiently, she repeated that she was fine with her weight and that she enjoyed her work. She was a person who loved and was loved by her family and friends. Her life was a blessing, and she was grateful for what she had. There was nothing else to be added or removed to make her happier. The workouts with me were just to get her body moving while she had some fun. I am convinced that Karen became my client for a reason—to teach me that to be healthy is to be loving. She trained with me for almost a year and never lost any weight. Want to read Chapter #1 free of charge? Download your copy by Clicking Here.